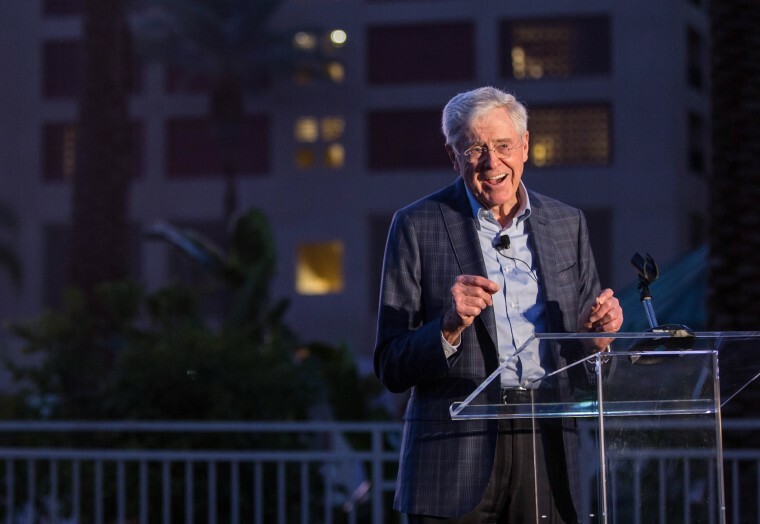 The Washington Post notes how the feud between Trump and the Koch organization is laying bare some of the biggest rifts in the party. The New York Times notes that Democrats are finally talking about health care again. POLITICO outlines five primaries where liberal insurgents could flex their muscles. Senate Majority PAC officials say they’ll spend $17 million to reserve TV airtime in six states in August: Indiana, Missouri, North Dakota, Nevada, Tennessee and West Virginia. 2020: Would Steve Schmidt advise a Democratic presidential candidate? FL-SEN: Ben Kamisar and Mark Murray look at Rick Scott’s overwhelming advantage on Florida airwaves. KS-GOV: Greg Orman is putting $650,000 of his own money into his campaign. MO-SEN: Team McCaskill is hitting back after a new ad resurfaced a decades-old claim of domestic violence against her husband. MN-GOV: Two weeks until the gubernatorial primary, the top candidates have already spent $3.5 million. ND-SEN: Heidi Heitkamp says she has no plans to seek an endorsement from the Koch network even though it’s declining to back Kevin Cramer. NV-SEN: A new poll has the Nevada Senate race in a dead heat. New anti-Heller ads take aim at his political donations. NY-GOV: Yet another poll shows Cuomo up by more than 30 points. SD-GOV: Could the race for South Dakota governor be.. kinda close? TN-GOV: Politico reports that Trump won’t endorse in the Tennessee gubernatorial primary. Trump didn’t mention Robert Mueller at his Florida rally, notes Jonathan Allen. But he did suggest that ID is required to buy groceries. The White House is looking at another reduction in refugees admitted to the United States. If enacted, it would allow the lowest number of refugees admitted since the creation of the resettlement program in 1980. Officials are increasingly worried about untraceable firearms — “ghost guns” — made from online gun kits. The New York Times profiles Cody Wilson, the man behind efforts to publish blueprints online for downloadable guns. Tony Podesta and other former lobbyists are under federal investigation following a referral from the special counsel. Trump didn’t come up on the first day of Paul Manafort’s trial. Trump advisers want even steeper tariffs against China, writes the Wall Street Journal. Civil rights and LGBTQ groups are unhappy with Jeff Sessions’ new religious liberty task force.